Fast forward three years and I need sleep. More of it. And I don’t think it’s going to come anytime soon. As parents we spend less time in our beds, that’s a given. So I truly believe that time we have in bed must be spent comfortable. Maybe a new mattress will help our situation? If it’s a magical mattress that will subliminally let four-year olds know their dads need more sleep and no more 5am wake ups? Hmm… I doubt it. But we can hope right? Our old mattress was around five years old, so not too old at all, I think they say you need to upgrade every eight years or so? I loved ours for the first few years, but I definitely noticed something changed the last couple years. It wasn’t as solid or firm. And I love to feel supported. I’ve actually had some pretty decent night’s sleep on my sons floor before now… Ssshhh. 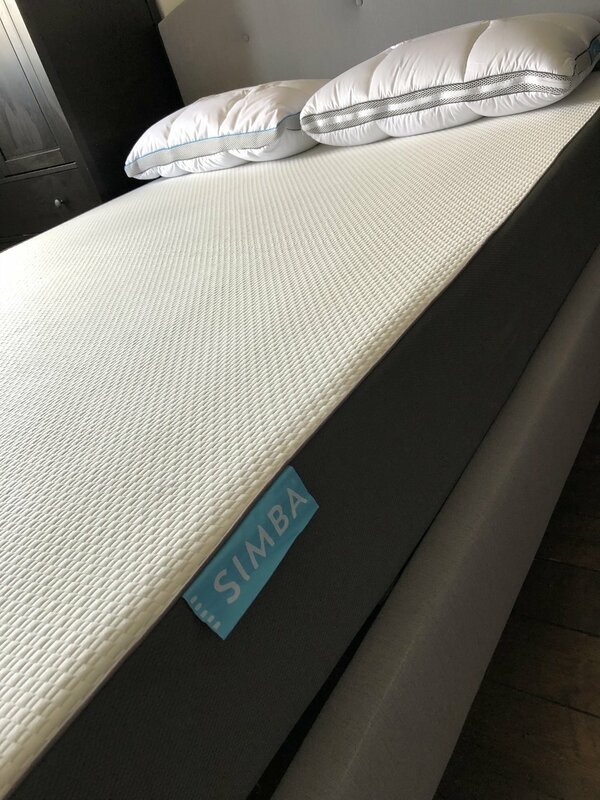 The Simba Hybrid mattress arrives in a box. A box you can’t quite believe is housing a king size mattress. Air tight and heavy we placed it on the bed and sliced open the bag with the handy little Simba cutting device (I’m all about the details so this was nice!) and with that first slice it starts expanding. Give it a couple hours and it’s a fully-fledged, lovely, ready to sleep on mattress. The mattress is scientifically engineered to give you the perfect night's sleep. It contains 2,500 pocket springs and has the luxurious memory foam feel as you lay down onto it. And trust me, it’s noticeable. In my opinion it’s in a different league to the old school stuffy mattresses. This feels different. It's solid and thick yet you sink into it in the right parts thanks to the memory foam. It completely supports your body whilst you sleep. It has 'five luxurious layers designed to fit you and help you get the quality of sleep you've been dreaming'. Scroll down here and see how each layer will help you get that good nights sleep. I know you’re going to cover your mattresses with protectors, fitted sheets and then your duvet and spreads… but knowing how cool it looks is also a plus point. It just looks good. The straight lines, no flouncy (is that a word?) designs like the older style ones… it looks so good in the room without anything on it! We both woke up after the first night and genuinely felt supple, like our bodies had rested, as well as our minds when we slept. I’m completely sold now after just a five nights, can you tell? We also went for two of the pillows available from Simba, the Hybrid Pillow with adjustable height and temperature control. Again, they knock our old ones out the park. We thought we were doing a good thing buying the firmest, hardest pillows but my husband in particular had been complaining about his neck whilst sleeping with these for a while. After just a few nights, these are proving to be way more comfortable. If you’re reading this and thinking those few precious hours you actually get in bed these days could do with being a little more luxurious and comfortable then you're in luck as I am part of their affiliate program. This means readers of the blog can currently get £75 off their first order (when spending £349 and over). Just follow this link to get claim your discount! This is a sponsored post in collaboration with Simba.